When you’re diagnosed with type 2 diabetes, doctors will urge you to manage blood-glucose levels through diet, exercise, and medication. That’s great if it works. But what if it doesn’t? Is taking insulin a mark of failure? A lot of people believe it is. Corinna Cornejo thinks otherwise. A healthcare-marketing content writer, blogger, and type-2-diabetes patient advocate, Cornejo is also a pragmatist who refuses to feel ashamed about taking insulin. When she was diagnosed in 2009, at the age of 49, she was able to manage of her blood-glucose levels through lifestyle changes and medication. But when she lost her job and life became extra stressful in other ways, too, including another illness, she decided it was time to change her approach. 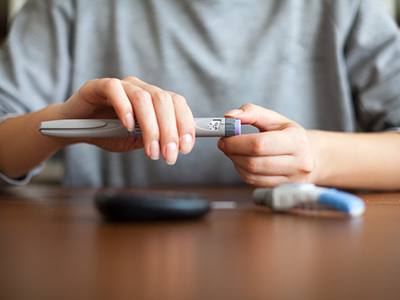 Here, Cornejo talks to HealthCentral about coming to terms with insulin injections and the products and strategies she relies on to stay healthy. HealthCentral (HC): Let’s talk about what happens when a person with type 2 diabetes starts taking insulin. Why do people feel ashamed? Corinna Cornejo: There’s a stigma attached to type 2 diabetes, the idea that if only you had lived more healthily, been more careful, then you could have avoided it. There’s no recognition that it’s more complicated than that — that there are some physiological predispositions or genetic aspects that also feed into whether someone develops type 2 diabetes or not. That shouldn’t be the case. If we’ve got treatments that can help people manage a chronic illness with fewer hypos or hypers and less possibility of complications in the long run, then it only makes sense to use those tools, medications, techniques, and whatnot. HC: Can you talk about how taking insulin affected your daily life and how you deal with those changes? Corinna: Sure. Before I leave my house in the morning I have to plan ahead. I have to take more than just the insulin and a needle. I also have to take my glucose monitor. I have to take alcohol wipes so that my hands and injection site are clean. I found a bag — a kind of cosmetics bag with a zipper — that would fit it all, so I wasn’t having stuff floating around in my purse or desk drawer. I need to do extra planning for the insulin. When your daily regime is taking pills, you can throw a pill box into your purse and you don’t have to worry too much about it getting too hot or too cold. Insulin is a totally different beast. It’s temperature sensitive at both ends, so it can’t get too hot and it can’t get too cold. I use an insulating case that has a cooling gel in it; you soak it in water and then you can put your insulin vial inside. It’s small enough to go in a cosmetics bag, or a purse or briefcase. If I need an injection before lunch I also need to think about where I’ll be. So, if I’m at a restaurant, who am I with? Am I comfortable testing my blood and taking a shot at the table? Sometimes, yes. If I’m sitting at a table with a bunch of diabetes advocates, man, it’s like a point of pride. Everybody pulls out their meter and puts it on the table and we all test together. If I’m at a restaurant with coworkers who aren’t so plugged into diabetes, maybe not. Maybe I excuse myself and go do what I need to do in the bathroom. Or I take care of it in my car before I go into the restaurant. Or I take care of it at my desk before leaving the office. All of those logistics, I made a point of trying to think them out in advance. HC: I understand you sometimes travel for work. How do you plan for that? Corinna: I do my damnedest to avoid having to take a shot while I’m on a plane. Part of that is there’s not a lot of space. The bathrooms are not very clean. But it’s also the air is pressurized and the vial of insulin is pressurized, so that changes how the insulin pulls into the syringe. What I do is I adjust my schedule so that the layover would be the time to take a shot. A day before, I think about, okay, tomorrow I’m getting on a flight. I live in Hawaii, so the first flight is always five hours, to get to the West Coast. So, I’m getting on a flight at 9 PM and I’m going to land at 6 AM. So 9 PM is late enough that I would normally be going to bed and I can do my before-bed routine before I get on the plane. When I land on the West Coast at 6 AM I make a beeline for the bathroom and take my morning shot. Get some food in me, some kind of breakfast, and get to the next gate, get to the next flight, get to the next connection. HC: Have you ever had trouble getting through airport security with your needles and insulin? Corinna: I have not had problems with TSA, but other people have said they have. It seems like that’s more of an issue when someone is wearing an insulin pump or a continuous glucose monitor. Those are attached to your body and sensitive to the x-rays or whatever the screening equipment is. But that hasn’t been an issue for me. I’ve found that major airports have sharps-disposal containers in the restrooms, so I don’t have to carry spent needles with me or try to find a way to dispose of them that’s safe. HC: Could you talk about medical professionals who’ve helped you? I understand that having a diabetes nurse working with you has been invaluable. Corinna: It’s a blessing and a curse living in Hawaii and having my insurance through an HMO. Diabetes is an epidemic here, so at least the medical system I’m in is set up with a lot of support. When I was diagnosed — and this is very unusual — I was immediately referred to a diabetes class, which was taught by a diabetes nurse. That was three or four sessions and it was probably four hours. I was immediately referred to a dietitian after completing the class. I probably worked with her over 10 months. I keep in touch with the nurse mostly via email. When I have questions, I can shoot them off to her. I share my blood-glucose logs with her regularly and also with the dietitian. Working with somebody who has some specialized knowledge is something I would strongly urge people to pursue, especially if their doctor is an internist or a general practitioner. HC: What about getting advice from other diabetics? You’ve said that for people with type 2 diabetes, talking to people with type 1 diabetes can be extremely useful. It was like practical advice without having to go into all the science. It was just like, “Try to move your injection site around. Don’t always take your shot in the same spot. Develop a pattern. Work your way left to right across the center of your body during the day. Or shoot in your arm or thigh or someplace that you haven’t been using a lot.” Being able to check with somebody who has the “been there, done that” was helpful. Is Type 2 Diabetes Your Fault?